A heavy band of rain was moving across the area including the Alamo River. The National Weather Service has issued a flash flood warning for south central Imperial County in southeastern California through 5:15 p.m. Friday. 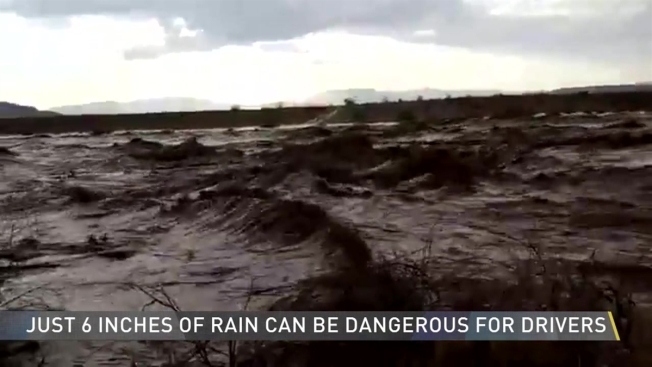 Video showing a flash flood in the desert east of San Diego was shared Friday by a California park ranger who hopes the video will warn people about the dangers of flash flood warnings. Kent Miller works for California State Parks and he shared a video showing fast-moving muddy water in Ocotillo Wells on Thursday. Miller wants to remind drivers that rain anywhere in the Imperial County area could lead to a flood, even if it's not hitting them at that moment. Also, if you're in a car, Miller said to remember the phrase "turn around, don't drown." It takes only 6 inches of water to make conditions dangerous for a vehicle. The video was captured in the Ocotillo Wells State Vehicular Recreation Area that spans Imperial and San Diego County.